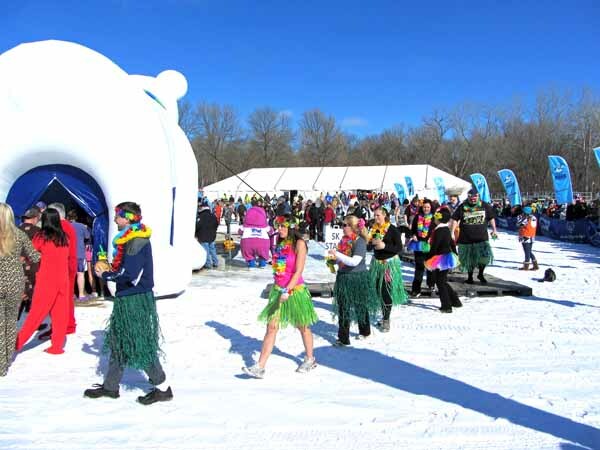 There's not a lot of fun things to do outside in Minnesota in February, so when we heard about the Prior Lake Polar Plunge we thought "Why not? Let's check it out to see what that's all about." 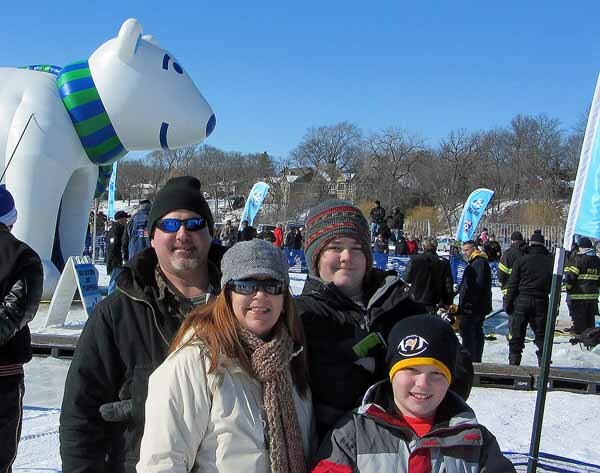 So we bundled up in our warmest clothes and headed out to the frozen lake. 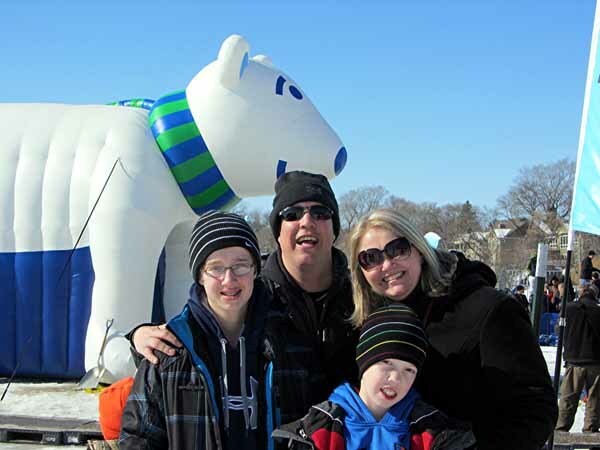 Our friends, The Walters Family, told us about the event. 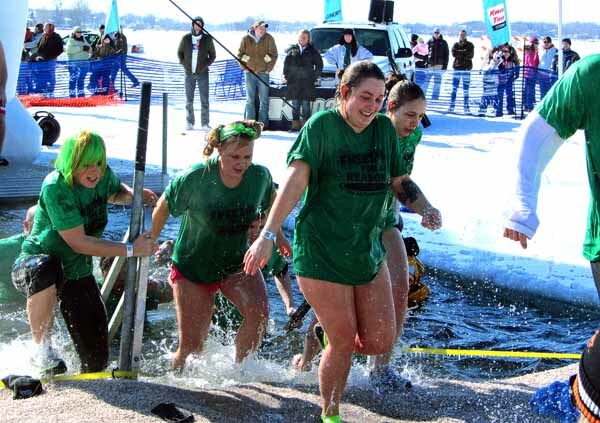 When Jen first mentioned it, I thought she actually wanted to participate in the event, but she was pretty animated that there was absolutely no way that she was going to jump in the lake in the middle of winter. She just thought it would be a lot of fun to watch other crazy people do it. I have to admit it was difficult to argue with her logic. When we arrived, I was amazed at the huge size of the crowd in attendance! 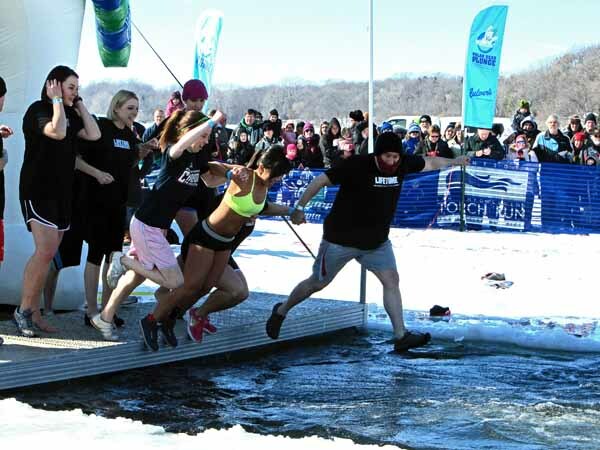 Apparently, we weren't the only ones who enjoy watching insane people jump into a frozen lake. 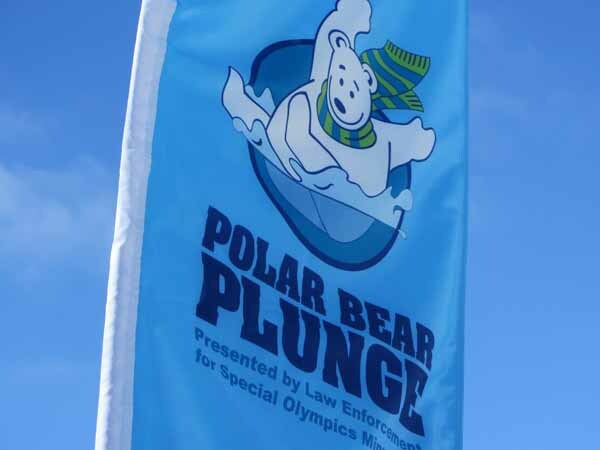 It's a good thing, too, because the event was held to raise money for the Special Olympics. Judging by the number of people there, I'm guessing they did pretty well at fundraising! There was a huge line of people dressed up and ready to go!! Since each one of them represented at least $75.00 in fundraising efforts, I'm guessing the event organizers were happy to see that are still so many psychos left in the world. You have to remember, this is Minnesota. In February. 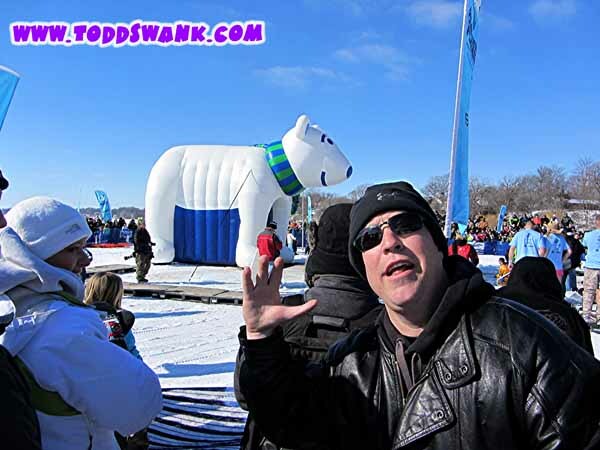 The temperature was only 15 degrees at the warmest point of the day. The lake had a layer of ice that was several feet thick. 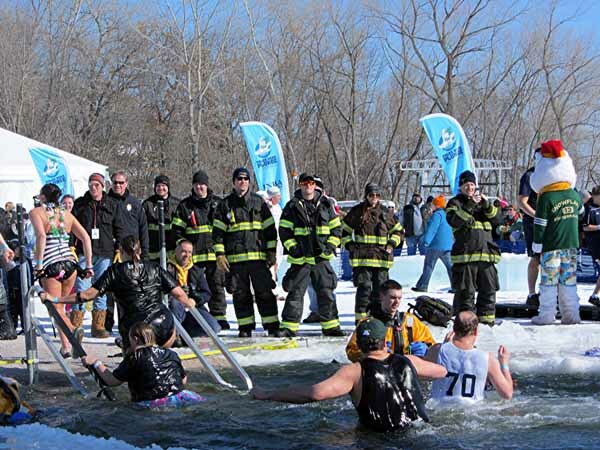 And these people cut a large hole in the middle of it so they could jump into the almost freezing water. I'm so happy that these people were raising so much money for the Special Olympics, but I just kept thinking to myself. "There has to be an easier way to raise money." Luckily, there were a lot of volunteers there in case anybody had trouble. Although I'm not sure why they had so many firemen present. We were there for at least a couple of hours and not once did I see any of the ice catch on fire. There were so many neat people there doing the jump representing every kind of company, organization, and group of people imaginable. I didn't see anybody back out of doing the jump once they got near it, but the screams were quite loud once they hit the water! 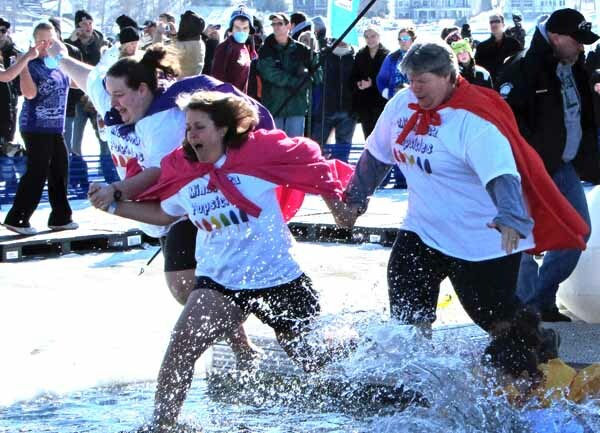 So many people were so brave to do the plunge. I can't say that I knew first hand what they were experiencing because I didn't do the jump myself. But judging from the looks on their faces the moment they hit that water, I could recognize that it was pretty painful. But painful or not, it didn't stop the groups from stepping up to the plate when it was their turn. Each wearing wackier costumes than the group before them. Some people seemed to forget their costumes entirely! Or the fact that it was only 15 degrees outside! I'm pretty sure they remembered, though, the second they hit that water! 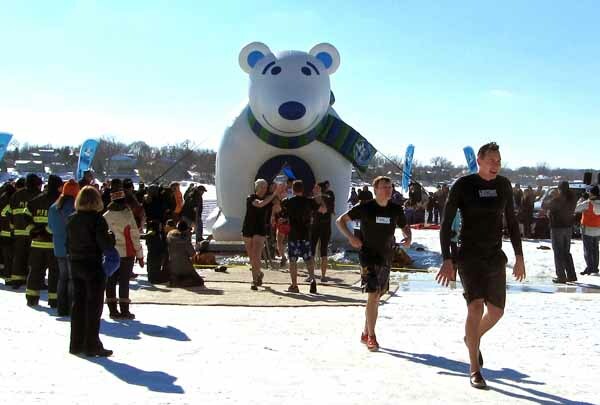 After watching so many brave people sacrifice themselves for such a good cause as the Special Olympics, I must admit I actually became quite inspired. I'm going to do my best to find a group of people to join me next year and take the plunge myself! Send me an email if you want to join me!